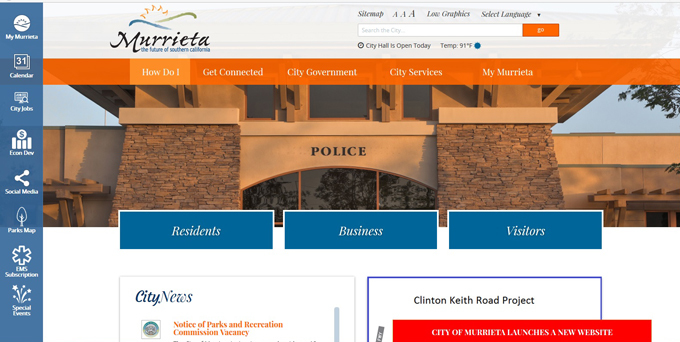 The City of Murrieta has launched a new website that is more attractive and user friendly in providing information on the community and city services to residents. MurrietaCA.gov includes interactive calendars where upcoming events are easily displayed; stories of local interest than can be shared on social media; and electronic forms for registration at local events. It translates easily to a mobile format. Users can also tag specific topics on their personalized task bar for easier repeat viewing. Subscribers can sign up for press releases and the monthly newsletter. Personalized features from the previous City website can be moved over to the new site as well.